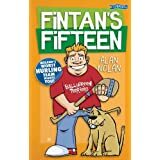 BleachHouseLibrary.ie: " Fintan's Fifteen " by Alan Nolan. Review by Mia aged 10.
" Fintan's Fifteen " by Alan Nolan. Review by Mia aged 10. The Ballybreen Terriers are the worst under12 hurling team in Ireland. But they weren't always that bad. Before our generation, they were one of the best, thanks to the Lonergan family. Follow the adventures of team Captain Rusty, No. 1 fan Katie and mascot Ollie the dog as they do their best to improve the Ballybreen Terriers. They do their best to find new recruits, even getting someone from Brasil who has never hurled before. Katie helps with training and the new manager, Fintan Lonergan is on the case! This book is funny and full of adventure as they try to fill a new team. I loved Ollie the dog, who was mostly in his dog house, and the comic strip pages where fantastic. When the rival team manager tried to steal the Lonergan cup, I was glued to the book. I would recommend this for kids age 8+.